All for Christ tells the story of the United Brethren Church from 1981-2017 (Trials and Triumphs stopped at 1981). However, the two volumes frequently dip into the past — sometimes all the way back to the beginning — to put things in context. You’ll read about influential leaders, new churches, missionaries, major issues which have confronted the church, outreach to new countries, and controversies along the way. Volume 1 takes the reader from 1981-1997. Volume 2 goes from 1997-2017. The year 2017 marked the denomination’s 250th anniversary. The author is Steve Dennie, the United Brethren Communications Director. He has worked at the UB National Office since 1978, and has been a lifelong UB member. 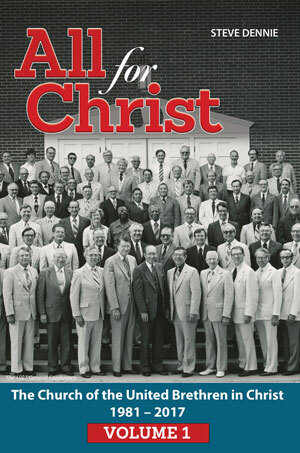 All for Christ, Volume 1 starts with the 1981 General Conference, during which a number of major leadership changes occurred, and during which ideas were set in motion which would be adopted in the years ahead. Several chapters focus on initiatives to merge with other denominations, and on efforts to implement new organizational structures. Mission fields get a lot of attention. Individual chapters tell the stories of United Brethren work in Nicaragua, Honduras, India, Macau, and Hong Kong. Several chapters are about Sierra Leone–the nationalization process which occurred in 1985, the rebel war of the 1990s, crises which have occurred there involving missionaries, and a run-down of missionaries who served in Sierra Leone from 1981-1994. The United Brethren church gave considerable attention to starting churches among Hispanic, Chinese, and Jamaican immigrants. Numerous other churches were started, or attempted. All of those stories are told. The denomination went through a division in 1889, led by Milton Wright, father of the Wright Brothers. That story is told, along with our changing views on abortion, war and peace, stationing ministers, and other issues. Both volumes: $25 plus shipping and handling when purchased from Church Resources. All for Christ, Volume 2 picks up from 1997. 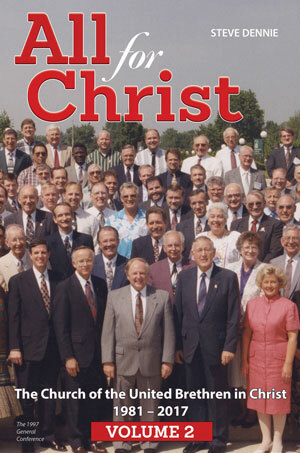 It reviews the major international expansion which occurred during the 1990s, as United Brethren churches arose in another nine countries. Individual chapters tell the stories of United Brethren work in Jamaica and Thailand, and other chapters explore further developments in Sierra Leone, Macau, India, and other countries. During the 2001-2005 period, the United Brethren church embarked on a major initiative to combine into a like-minded denomination, the Missionary Church. Several chapters tell about that turbulent period. Other chapters illuminate debates over the years regarding higher education, alcohol, and women in ministry (the United Brethren have been generally progressive in this area). In 2005, the United Brethren church basically blew up the structure it had used since 1800–a system of regional conferences–and went to something entirely different. There were enormous ramifications. The chapters from 2005 on show how the church picked up the pieces and put new systems in place. The epilogue, written on the occasion of the 250th anniversary, goes back to 1767 to tell the story of how the Church of the United Brethren in Christ began–its early leaders, major meetings, westward expansion, and other glimpses of those early years.